WASHINGTON — A week out from the midterm elections, the Pentagon said Monday it is sending 5,200 troops, some armed, to the Southwest border this week in an extraordinary military operation to stop Central American migrants traveling north in two caravans that are still hundreds of miles from the U.S. The number of troops is more than double the 2,000 who are in Syria fighting the Islamic State group. President Trump, eager to focus voters on immigration in the lead-up to the elections, stepped up his warnings about the caravans, tweeting: "This is an invasion of our Country and our Military is waiting for you!" Trump's warning came as the Pentagon began executing "Operation Faithful Patriot," described by the commander of U.S. Northern Command as an effort to help U.S. Customs and Border Protection stiffen defenses at and near legal entry points. Advanced helicopters will allow border protection agents to swoop down on migrants trying to cross illegally, he said. "We're going to secure the border," Air Force Gen. Terrence O'Shaughnessy, the Northern Command leader, said at a news conference. He spoke alongside Kevin McAleenan, commissioner of Customs and Border Protection. Eight hundred troops are already on their way to southern Texas, O'Shaughnessy said, and their numbers will top 5,200 by week's end. He said troops would focus first on Texas, followed by Arizona and then California. Asked about the approaching caravan, California Attorney General Xavier Becerra pushed back on the notion that the migrants are violent and called Trump's plans to use American troops in response "disturbing." "My sense is that these migrants that are traveling by caravan are not looking for violence," Becerra said in an interview late last week with KQED. "When you move troops anywhere, you're moving people who have been trained to defend this country to the point of killing others," he said. "And so we've always been careful in how we deploy our troops. That this president makes such facile use of our troops is disturbing." 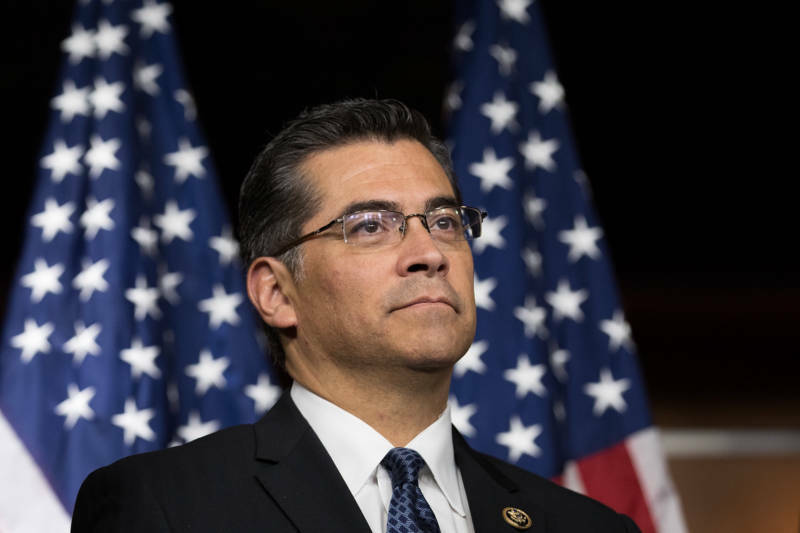 "I believe that this nation has a right as a sovereign nation to decide who comes into the country," Becerra added. "And I believe anyone who wants to enter this country must do it according to our laws. But I also believe that our federal government must abide by those same laws when it exercises its powers in dealing with those who might want to enter the country. And so I fear that this administration is sending the wrong signals to people about how it approaches not just these migrants but the law." 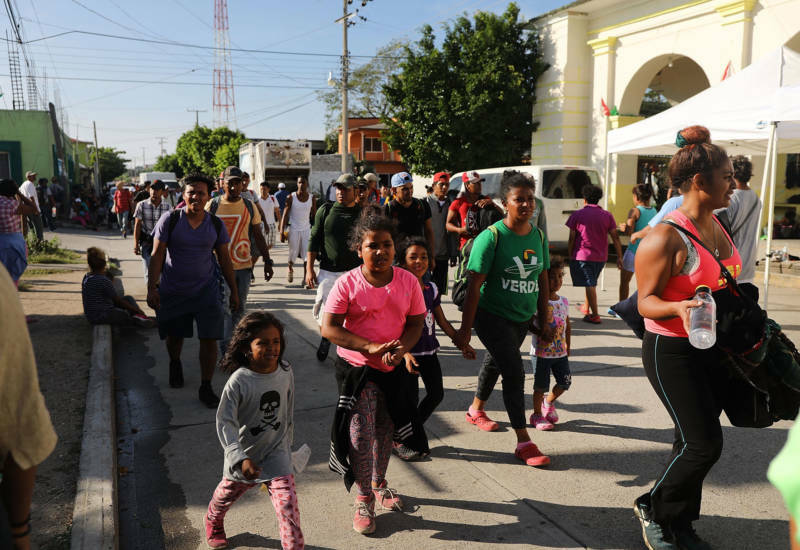 The number of people in the first caravan has dwindled to 3,500 from about 7,000, though a second one was gaining steam and marred by violence. 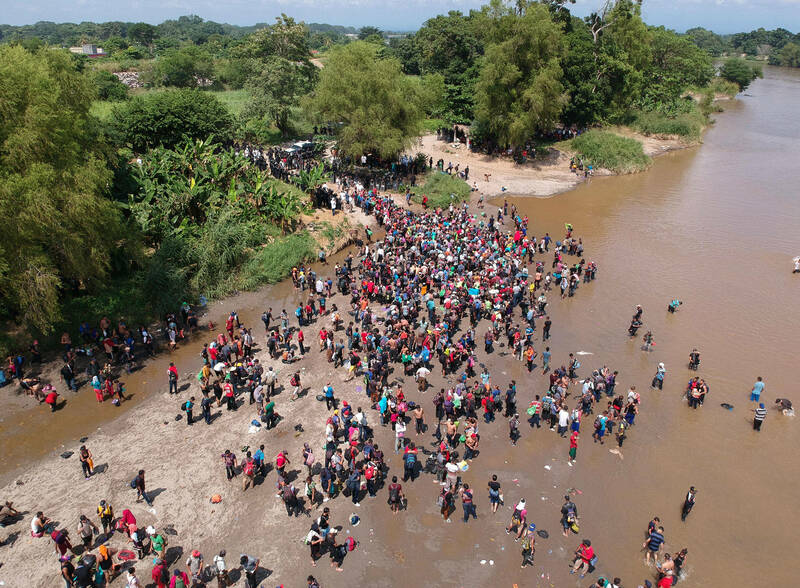 About 600 migrants in the second group tried to cross a bridge from Guatemala to Mexico en masse on Monday, but were met by ranks of Mexican federal police who blocked them from entering. The riverbank standoff followed a more violent confrontation Sunday when the migrants used sticks and rocks against Mexico police. One migrant was killed Sunday night by a head wound, but the cause was unclear. Overall, they are poor, carrying belongings that fit into a knapsack and fleeing gang violence or poverty. It's possible there are criminals mixed in, but Trump has not substantiated his claim that members of the MS-13 gang, in particular, are among them. The president's dark description of the caravan belied the fact that any migrants who complete the long trek to the southern U.S. border already face major hurdles, both physical and bureaucratic, to being allowed into the United States. 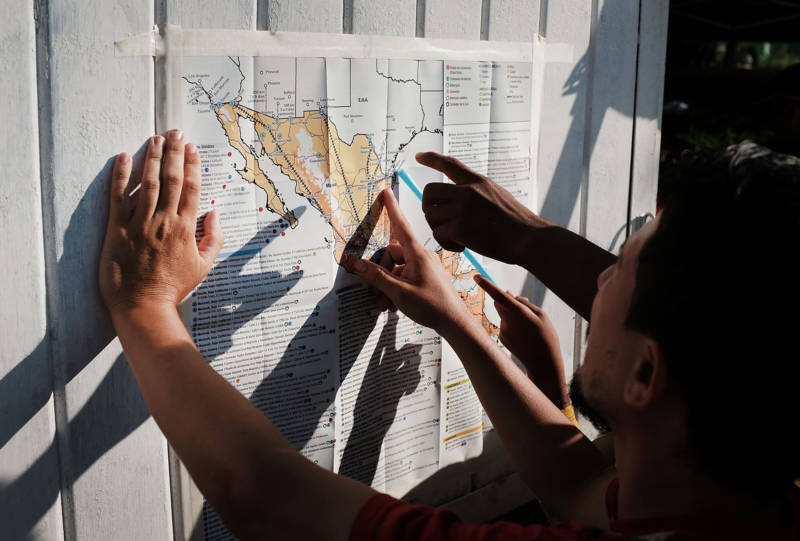 Migrants are entitled under both U.S. and international law to apply for asylum, but it may take a while to make a claim. There is already a bottleneck of asylum-seekers at some U.S. border crossings, in some cases as long as five weeks. McAleenan said the aim was to deter migrants from crossing illegally between ports, but he conceded his officers were overwhelmed by a surge of asylum-seekers. He also said Mexico was prepared to offer asylum to the caravan. Military personnel are legally prohibited from engaging in immigration enforcement. The troops will include military police, combat engineers and others helping on the southern border. The escalating rhetoric and expected deployments come as the president has been trying to turn the caravans into a key election issue just days before the midterm elections that will determine whether Republicans maintain control of Congress. On Monday, he tweeted without providing evidence: "Many Gang Members and some very bad people are mixed into the Caravan heading to our Southern Border." The troops are expected to perform a wide variety of functions, such as transporting supplies for the Border Patrol, but not engage directly with migrants seeking to cross the border, officials said. One U.S. official said the troops will be sent initially to staging bases in California, Texas and Arizona while the CBP works out precisely where it wants the troops positioned. U.S. Transportation Command posted a video on its Facebook page Monday of a C-17 transport plane that it said was delivering Army equipment to the Southwest border in support of Operation Faithful Patriot.